Upright: Movement, fast paced change, action, alignment, air travel. Reversed: Delays, frustration, resisting change, internal alignment. The Eight of Wands shows eight sprouting wands sailing through the air at high speed. Their flight suggests change, movement and travel. The sky is clear and the beautiful river is flowing freely and giving life to the surrounding landscape. The Eight of Wands says the struggles of the Seven of Wands have now all but cleared and you have the freedom and space to move forward with your plans once again. 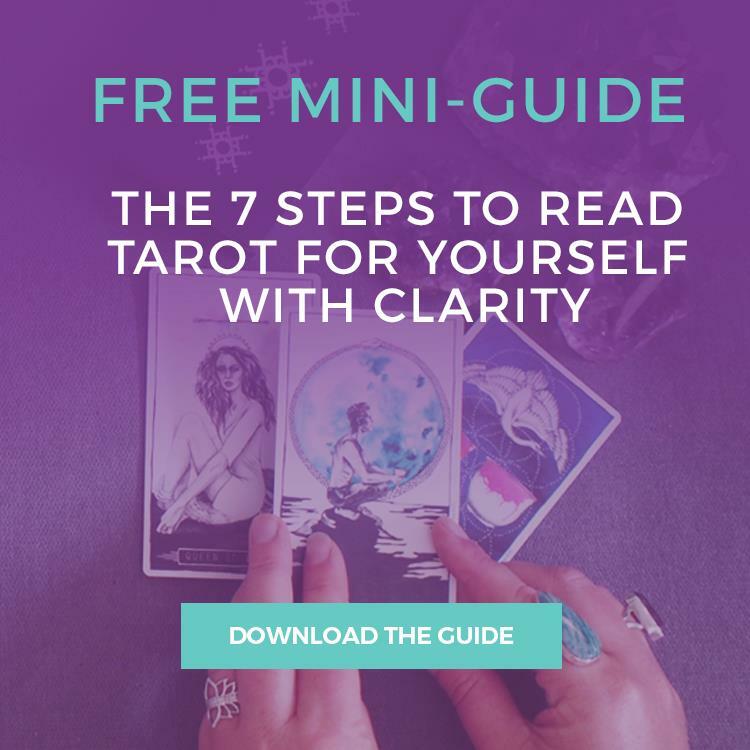 This Eight is a dynamic card, containing a high level of energy that propels you forward to reach your goals at a much faster pace than ever before. You can expect to be very busy, but this is one of those ‘good busy’ periods during which you are enthusiastic about the progress you are making. The Eight of Wands encourages you to go with the flow; don’t resist it. Everything is moving fast right now, so make the most of this forward momentum to manifest your goals and dreams. Allow the energy of the Universe to flow through you and propel you closer to your goal. Trying to slow things down because you’re not ready or you’re fearful about the unknown will just waste this opportunity. Use the energy instead to fuel positive change and produce significant results. The Eight of Wands also invites you to be laser-focused with your intentions and actions. Determine what you want to manifest and then align all of your resources and energy to focus on that singular goal. Remove all distractions and devote yourself to the task with total concentration, determination and will. This experience can be highly productive, allowing you to accomplish a lot in a short time. 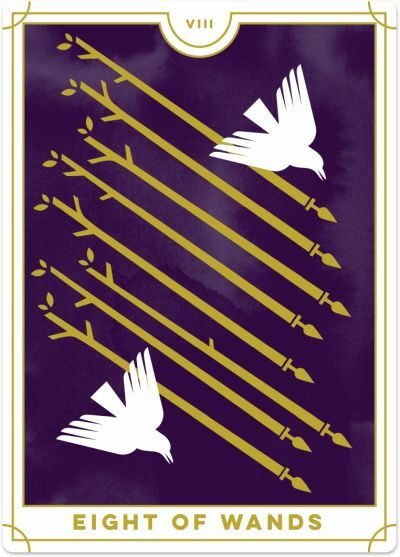 With the Eight of Wands, you can look forward to the rapid completion of a project currently underway, but you can also expect to be occupied by something new and even more exciting soon. There is no stopping you right now as you are just bursting with energy and ideas, and you cannot wait to achieve one task and start another. To maximise this energy, make sure your activities align with your broader goals and invest in the right things at the right time. Also, make sure your previous task is complete before you move to the next one. This card is a sign to ‘strike while the iron is hot.’ It is most definitely an action-oriented card that encourages you to move quickly to pursue the best opportunities available. There is no waiting around while the Eight of Wands is present, so determine where your energy should go and get on with it! Often, the Eight of Wands suggests air travel, a short-term or whirlwind trip, such as a business trip or holiday. You may even enjoy being part of a tour group that visits ten countries in as many days! The Eight of Wands reversed suggests that you are charging ahead with an idea or plan, but you need to slow down and consider your next steps before continuing. You may miss something in your haste and be prone to making mistakes or poor decisions. Or, you may rush into things without a clear plan of where you are heading, instead of investing time into trivial tasks. Be careful of the ‘bright shiny object syndrome’ where, just as you get started on implementing one idea, another one comes to mind, and you switch your focus. The trouble is that with this approach, you never accomplish anything because you are jumping from one idea to the next and finishing none of them. The Eight of Wands reversed can warn that you are resisting change, trying to stop the flow of energy and movement. It will only make things harder, so let go and be in the flow. If you have been feeling stuck, do things differently (new routines, locations, activities) and get the energy moving once again. The reversed Eight of Wands can mark significant delays, particularly concerning travel or fast-moving plans. Despite having a lot of energy and enthusiasm to progress things forward, you now face multiple obstacles in your course. This is incredibly frustrating, and you may be growing increasingly impatient by the day. Keep looking for alternative ways around the challenges presented so you can carry out your plans. If it’s Mercury Retrograde, expect your plans to be doubly delayed! Similarly, this card can be a sign to hold off your activities for a short amount of time until the situation becomes more stable and predictable. On the other hand, the reversed Eight of Wands may be a sign that you are aligning your resources so you can actively pursue your goal. You are getting your life in order – physical health, emotional well-being, energy levels or spirituality – so that you are in an excellent position to move forward with your plans.